Provided below is the “Introduction” to my new Civil War book, The Confederacy at Flood Tide. It is available at Amazon, Barnes & Noble, Wal-Mart and other bookstores. It is also a History Book Club Selection. (Abundant footnotes are in the book, but not in this free sample.) To inspect all of my books, please visit my author page at Amazon. The Confederacy at Flood Tide was selected as a title to distinguish this book from the popular notion of the Confederacy at high tide. The latter expression is generally associated with Pickett’s Charge at Gettysburg, or, secondarily, the Rebel attack on Starkweather’s Hill at Perryville, Kentucky. However, the story of the Confederacy’s most opportune period for winning independence involved developments in Europe, Virginia, Washington, Maryland, Kentucky, Mississippi, and even Missouri and Arkansas. Although it lasted only six months, from June to December 1862, the rising tide flooded all theaters of the war. It was not an isolated surge in Maryland or Kentucky. For example, at Prairie Grove, Arkansas, in early December 1862, more Missourians fought to win their state for the South than fought to keep it in the Union. Moreover, the Confederacy’s flood tide was not limited to military factors. It also swelled within the sectors of diplomacy, politics, and espionage. For instance, on July 4, 1862, the Confederacy signed a secret contract with a leading British warship builder for two deep-water ironclads superior to anything in the US Navy and capable of crossing the Atlantic. US Secretary of State William H. Seward instructed his ambassador to Great Britain to inform Palmerston’s government that any attempt to intervene in America’s Civil War would result in a break in diplomatic relations with the United States, thereby implying that war between Britain and the United States would likely result. Such a war would have challenged both sides. Although it would be hard for Britain to maintain an army in America, its powerful navy might have ended the federal blockade of Southern ports and even blockaded Northern harbors. Contrary to popular belief, the Monitor and Merrimack (CSS Virginia) were not the first ironclad warships. The British and French began building bigger and faster deep-water ironclads before America’s Civil War started. As one of the weapons used by the Union to reverse the Confederate tide, the Emancipation Proclamation was more controversial than commonly supposed. Contrary to popular belief, many contemporaries were confused, critical, and frightened by its implications. Major General George McClellan, among others, believed it was a deliberate attempt to incite a slave rebellion in the South. This entry was posted in Uncategorized and tagged American Civil War, Antietam, Braxton Bragg, Corinth, Pea Ridge, Perryviille, Prairie Grove, Robert E. Lee, Stonewall Jackson on May 31, 2016 by Phil Leigh. Provided below is a copy of the catalog page for my fourth Civil War book, which will be released next spring (2016). This entry was posted in Uncategorized and tagged Antietam, battle of Corinth, battle of Perryville, Confederacy at High Tide, Emancipation Proclamation, James Bullock, Prairie Grove on December 3, 2015 by Phil Leigh. What if Missouri had joined the Confederacy? Actually, most Civil War students realize that Missouri and Kentucky are represented in the thirteen stars of the Confederate Battle and National flags. Missouri’s star was added in October 1861 when a shadow government passed a secession ordinance in Neosho, in the state’s southwest corner. It was in exile during most of the war. A Rebel Kentucky government was similarly recognized by the Confederacy in December 1861. It even temporarily occupied the state capitol at Frankfurt in October 1862 during the Confederate offensive by Bragg and Kirby Smith. Among the states represented by the 13-star flag, Missouri ranked second in population behind Virginia. Additionally, St. Louis barely trailed New Orleans as the Confederacy’s largest city. Richmond’s war department assigned Missouri to the Trans-Mississippi District, which encompassed the vast region west of the Mississippi River. 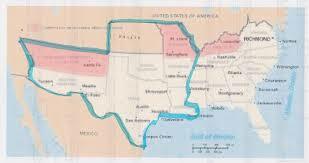 It included the populations of Louisiana’s parishes west of the river and the entire states of Arkansas and Texas. It also included the Indian Nations of present-day Oklahoma and the Arizona Territory, which encompassed the present states of New Mexico and Arizona. This entry was posted in Uncategorized and tagged Civil War Arkansas, Civil War Missouri, Civil War Trans-Missippi, Pea Ridge, Prairie Grove, Sterling Price, Thomas Hindman, Wilson's Creek on June 12, 2015 by Phil Leigh.